Morning Meeting is part of the wonderful Responsive Classroom management system but can be used in any classroom! This system builds a strong, loving classroom environment. Use these sharing prompts to start the day off on a great note or during the day as a community building exercises at a moments notice. My class absolutely loves this time of the day. This set includes over 100 prompts! Topics of the prompts range from interests, feelings, situational, family, wishes, favorites, and social emotional reflections. 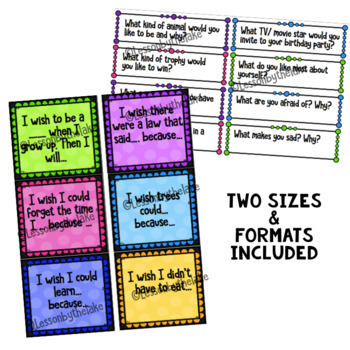 These sharing prompts can be used in any classroom with or without morning meeting to build a strong classroom community. Check out my other morning meeting products!